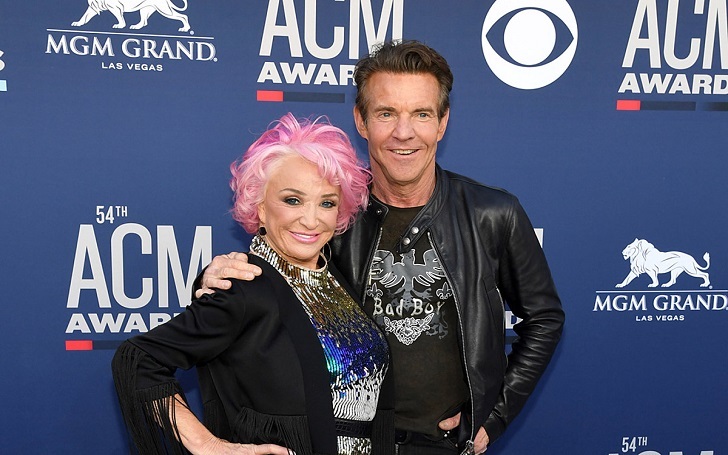 For years, Tanya Tucker and Dennis Quaid have been pals, but their recent outings together have sparked dating rumors. According to sources close to the pair, the longtime friends have been attending multiple country music events together. The Delta Dawn singer was even spotted sitting on the Soul Surfer star. However, the relationship between them is strictly platonic. A source told PEOPLE, "They are not a couple! They are longtime friends and having a blast collaborating and making music together." Tanya, 60, and Dennis, 65, first met on the set of his movie The Night the Lights Went Out in Georgia (1981) when the songstress recorded a song for the soundtrack. Tanya told the outlet that she and Dennis ended up going decades without dating. The duo has been attended multiple events, including the ACM Awards, together. They also attended the birthday tribute concert of Loretta Lynn earlier this month, where the singer was spotted sitting on the lap of the actor. The pairs had a talk with PEOPLE ahead of the ACM Awards 2019 on Sunday, April 7, at the MGM Grand Garden Arena in Las Vegas. They shared with the outlet that they’ve been working on music together. The first time I worked with him, I was 20. Just a few years ago. It was my first movie. We reconnected a few months back, after [almost] 40 years.